An interesting report from Bloomberg on Russia's demand for oil exploration and production JVs with Western companies: here. One core reference is to the new/old Bazhenov superfield which I covered before here. Meanwhile, I commented before that Ukraine gas supply disruption is a distinct issue from the European gas supplies, as Ukraine has a separate contract relating to gas transit and this contract has always been paid in full and there are no arrears on it. Ukraine legally does not own the gas it transits. In other words, any disruption to supply of gas to Europe via Ukraine can only come from Ukrainian authorities appropriating gas that belongs to other countries. I expect this to be highly unlikely, especially since Ukraine has pumped in gas reserves sufficient to last it through mid-December 2014. To confirm this, here is the EU Commission position on the issue of security of supply to European customers. And Gazprom position on the issue: "Russian gas transit supplies via Ukraine are being delivered in routine mode. The daily gas amount stands at slightly more than 185 million cubic meters. An emergency headquarters started working in Russian energy giant Gazprom, monitoring the situation every day. If Gazprom finds that gas intended for Europe is left in Ukraine, Russia will increase gas supplies via Nord Stream and Yamal-Europe projects, Miller said. The upstream throughput capacity of Ukrainian gas delivery system makes 288 billion cubic meters and the downstream one amounts to 178.5 billion cubic meters. The country’s gas transportation system consists of 72 gas compressor stations, 110 shops and 1,451 gas hubs. The length of gas pipelines makes 38,600 kilometers." Predictably, Ukraine blames 'terrorists' (aka 'separatists') for today's explosion. Report here. However, not known for its pro-Russian views, Euronews had to acknowledge that "...explosion was far from the violence in east Ukraine..." Never mind, we know Ukraine has no extremists on the other side of the ethnic divide... why, none at all... and none of them would ever want to do any harm to Gazprom lines to Europe... why, never, of course. 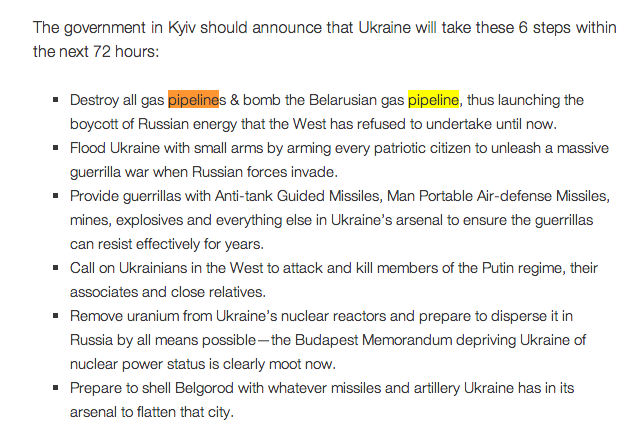 It is just so slightly inconvenient that Mr Yatsenuk's own backers - Euro Maidan - are on the record saying they are in favour of blowing up pipelines: http://euromaidanpr.wordpress.com/2014/04/13/plan-b-flatten-belgorod/. Truth is - we simply do not know who blew up the pipe, and it is unlikely we will ever find out.